When it comes to games for an 18th birthday party, there are many possibilities. From video games to those that encourage a friendly competition among friends, there is nothing better than a few games to break the ice and liven up a party. You can choose a few fun games and create a memorable celebration that everyone is sure to enjoy. 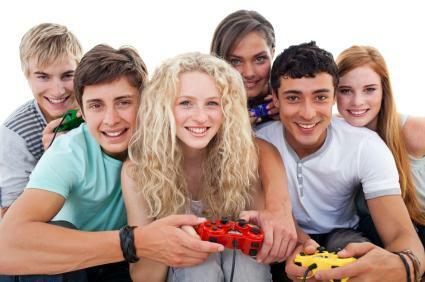 Consider the following teen games for your 18 year old's birthday celebration. As each guest arrives to the party, tape a slip of paper to the back of their shirt. Once they begin to mingle and talk, have them write their first impression of each other on the slip of paper. For example, if a boy is extremely funny, his slip of paper will most likely say that he has a "good sense of humor" or is "silly". Make sure that the comments stay clean and friendly. Once everyone has talked, have them take off their papers and write their names on the back. Read the comments out loud and see who can guess the person being described. The person who guesses the most guests correctly is the winner. The team that brings the most photos in at the end of the hunt are the winners. At a party with a large number of guests, offer a variety of sports and play them tournament style. Divide the teens into groups and have them play against each other until there is a winner. You can set-up a poster board with tournament brackets and write in each team's name. Some fun sports to play include basketball, volleyball, darts, and table tennis. Board games are fun for all ages. If there are too many people to play the first round of games, set it up as a tournament so everyone has a chance to play. You an also offer more than one type of board game. Some teen-friendly games that are suitable for both boys and girls include Apples to Apples, Taboo, Twister and Quiddler. Many teens are hooked on video games. If your 18 year old loves to game, consider featuring some video games at their birthday celebration. He and his friends may already have their favorites for their specific gaming system. Some popular video games for older teens are Mario Kart, Guitar Hero and Dance Central 3. A water balloon battle can be a great way to pass the time and burn off extra energy. Fill up water balloons before the party and have them sitting in a large tub or inflatable pool. Teens can run around and throw balloons at each other; whoever ends up getting hit is out. You can also divide the teens into groups of two and have them toss balloons back and forth to each other. The team with the last person holding a full water balloon wins. Before the party write down an assortment of words, phrases, and even movie titles on small slips of paper. Place the slips of paper into a basket. The group can play as a whole or be divided into two groups, such as boys and girls. One person from the team will be the drawer and the others will try to guess what she is drawing. The person drawing cannot speak and can only draw using images. No words or letters are permitted. The members of the team will call out answers until someone guesses correctly. You can set a time limit for each round and award points to the team that guesses the correct answer within the time frame. If the drawing person's team does not answer correctly within the time frame, the other team can "steal" with a single correct guess. At the end of a designated number of rounds, the team with the most points wins. Guests try to name the tune, as well as the artist. For a twist, as the songs play, have the teens get up and dance. At the end of the playlist, the person with the most titles and artist wins. When it comes to planning games for an 18th birthday party, the most important thing to keep in mind is to offer a wide variety of games so that there is something for everyone to take part in playing. Teens have a wide range of interests, so be sure there is something for the birthday boy and his guests.